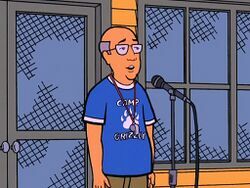 Mr. Potts is the only staff member of Camp Grizzly that we actually meet, seen in the episode, "Camp Fear". It is not known if he is the owner or the manager, but he is clearly the person in charge. He is shown as well-meaning, mellow and at the same time well aware on what a summer camp is all about (a place parents send their kids to get them out of their hair for a few weeks) and warns Skip Stevens to not let the camp "be your whole life." Having to work with Skip seems to tire him out. This page was last edited on 23 April 2018, at 21:52.